MC2 by Intracorp is a new development located near Canda Line Marine drive station. It will have 443 suites on 33 floors. 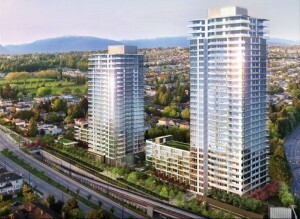 Within walking distance of these Vancouver condos are a variety of stores, including a brand new T+T Supermarket, Real Canadian Superstore, Safeway, and Canadian Tire. And there’s a Cineplex Theatre just across the street, featuring 11 state-of-the-art screens, VIP cinemas and UltraAVX auditoriums.